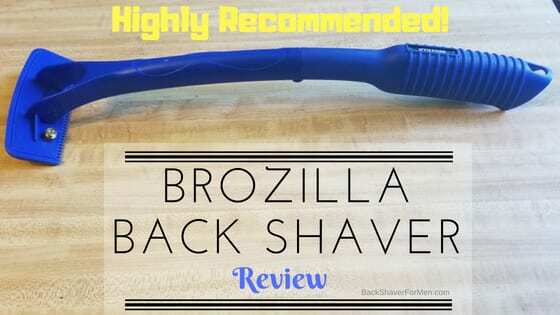 This is a review of the Brozilla Back Shaver in which I highlight key feature both positive and negatives and offer my opinion of how good this back shaver works. This is in design and handle shape, is very similar to one of my highest ranked shavers, the Bro Shaver. But with the added feature of having a foldable handle for ease of storage or travel. To see my full in-depth review of the Bro Shaver head over to my page, Bro Shaver Review. What Is Brozilla Back Shaver? This is a self-reliant back shaver, as the handle is easily long enough to reach all areas of the back without the help of an assistant. The handle is curved to allow shaving the many contours of the back. This Brozilla shaver uses three safety razors lined up in a row to provide a wide shaving area. These razors are easy to replace and pretty dang cheap too. Making it a very economical purchase and should provide years of back hair riddance. 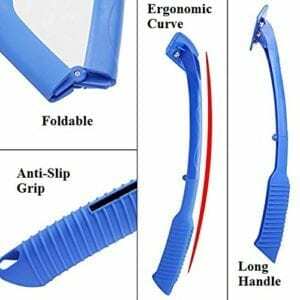 1 – Back Shaver with foldable handle. 15 – Double-sided safety razors. 1 – Handbag for storage or travel. 1 – Plastic shaving head cover. 3 – Knurled Brass thumb screws. Brozilla comes in at 18 13/16″ at its length and 5″ wide at the shaving head. The cutting edge with the three razor blades lined up comes in at 4 3/8″ wide. There is also a plastic row of teeth before the razors which will comb the hair right before the razors. This allows for a great shaving experience. The weight on this is light to very light. Making it very maneuverable. How Good Is The Brozilla Back Shaver? This will shave hair very close to the skin. It will effectively shave an area in one to two passes, typically just one pass will do the job. You hear that sound that the razor makes when it shaves hair, and you know it is doing what it was designed to do, shave hair. Very pleasing and satisfying shave. The length was very adequate for reaching every area of my back without having to put my arm in a weird position. Another key feature is the wide shaving head, as this will shorten the length of shaving your back. The razors provided are sharp and work great too. Collapsible handle. This is great for storage and or for traveling. The hinge point in the middle of the handle locks securely and has a real solid feel. A high selling point is that it is really cheap to refill, as this design uses standard safety double edge razors. These typically can be purchased for a box of 100 for around $12.00. A box would almost certainly last you a lifetime. As each side of the blade lasts for at least 4 to 6 shaves then you can flip that same razor over and get at least another 4 to 6 shaves out of those razors. Easy and simple to change blades, having just three thumb screws. Great shave. As this gives one of the closest shaves I have reviewed. Virtually no clogging with back hair. Hair just falls to the floor in clumps. Has a hole at the end of the handle in which you can hang it or attach a lanyard. Blades that come with this back shaver are sharp. Comes with 15 free razors. Keep in mind these can be flipped when they are no longer sharp, as these are double sided. Comes with a storage bag. I really appreciate this, keeps everything stored, neat and tidy. Also comes with a plastic blade guard, that just slips over the head of the shaver for storage. This is a great safety feature. Very light handle that wields effortlessly. Good angle on the handle, as I shaved my back without any frustration at all or the need to think about how to get that angle. A great option for really hairy backs. Can also be used elsewhere on the body, below the neckline. Brass thumbscrews. This will not rust out on you. I got zero cuts when using this back shaver! No website, in which to order from. 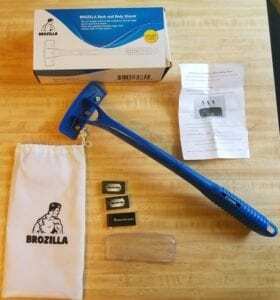 At the time of writing this review, there is no available Brozilla Back Shavers on Amazon. Must have got the last one…I guess. Hopefully, things get restocked in the future. Not the most comfortable handle in the world. Doesn’t fit the hand that well and it has some awkward angles on the underbelly of this shaver. Some skin irritations from using this back shaver. This is due to the fact of how close this shaver shaves your back. A day later you have no discomfort. Reading the instructions is important prior to putting in the razors into the handle. As improver placement of razors can lead to badly cutting yourself. Also, take your time when shaving especially the first time. Slow down and you’ll find this back shaver does a really good job of removing unwanted hair. Have your strokes as straight as you can when shaving, with no side to side movement. This will eliminate cutting yourself. Do yourself a favor and purchase some quality replacement blades. A good brand is the Astra Superior Platinum Double Edge Razor 100 blades. My initial thought and overall thoughts on the Brozilla Premium Back Shaver is it a damn good back shaver. This would make my top 4 for sure if it was more available to be purchased. As at the time of writing this article, I can not find one for sale. Brozilla doesn’t have a website and Amazon is currently out of these for sale. A real bummer, as this is actually better than overall than the Bro Shaver which does make my top list of back shavers. A real close shave with zero clogging issues. This will store easily as well as great to travel with, having the folding handle is a real plus. Plus the other major advantage is the very low cost of buying replacement blades. If you can find this back shaver pick it up. You will not regret this purchase. The handle is lacking comfort. Zero issues with clogging with hair. Unavailable to easily find to purchase.